Some textbooks provide the students with just a few vocabulary words so the students can practice the grammar point of the unit. For example, the textbook presents the verb “to be” and then provides five places the students can be. However, the students usually want to say a real place that they can be, not the ones that the textbook has selected for them. A textbook needs to offer students many vocabulary words so that the students can select those words that have meaning for them, that help the students to express what they want to say about the topic. When students engage in meaningful communication, they use words that are important to them. Students can have active vocabulary, i.e. words that can use to communicate about themselves, family or friends and passive vocabulary, i.e. words that they can recognize when heard or read. I usually present my students with long lists of vocabulary for a topic and ask them to recognize all the words in the list but to be able to actively use at least six of the words to describe themselves, family or friends. For example, when I present personal adjectives, they have a long list. I quickly pronounce the words and have them pronounce the words. Then, the students scan the list to find words that actually do describe themselves, their father/mother, brother/sister or a close friend. They “study” those words. They prepare to describe themselves, family and friends. As they listen to other students describe themselves, family or friends, they passively hear many other adjectives. Students can learn a handful of words that accurately describe themselves, family and friends. On the other hand, when teachers give students a list of thirty or more words for a topic and require the students to actively learn all the words, students often do poorly. Such a long list is not productive nor meaningful to the students. Do you supply your students with sufficient vocabulary that they can communicate what they want to about the topic, not what the textbook wants them to talk about? A test of a modern language textbook’s communicative ability is to look at what the book has students do with the grammar after the textbook presentation of the grammar point. For example a Spanish textbook may supply the forms of the verb ser and then give the rules for using ser. The book may give one or two examples of origin such as “I am from Argentina.” Or they make have a sentence or two example to show that ser is used with occupations such as “Sr. Ríos es dentista”. The book may explain ser being used for identification with a sentence such as “It is a backpack. Does the book provide the modern language students with enough vocabulary to be able to talk about themselves, family or friends using the verb? Does the textbook provide the critical questions that students might ask using that verb? For example, does it provide the students with “Where are you from?” for origin? Do it provide the question “What is this?” so students can ask the question of identifying something? Furthermore, does the book give numerous countries so students can tell what country they, their parents or grandparents are from so they can realistically answer the question? For occupations, does the book provide numerous occupations so the students can say the actual occupation of family and friends? For identification, do the students have a list of classroom objects so when someone says “What is this?” they can respond, “It is a book”? with things they do see in the classroom? If the textbook does not supply essential questions or realistic answers for the modern language students to apply the grammar to talk about their own lives or the lives of family and friends, then the book’s focus is grammar, not communication. Does your textbook have a communicative or grammatical focus? 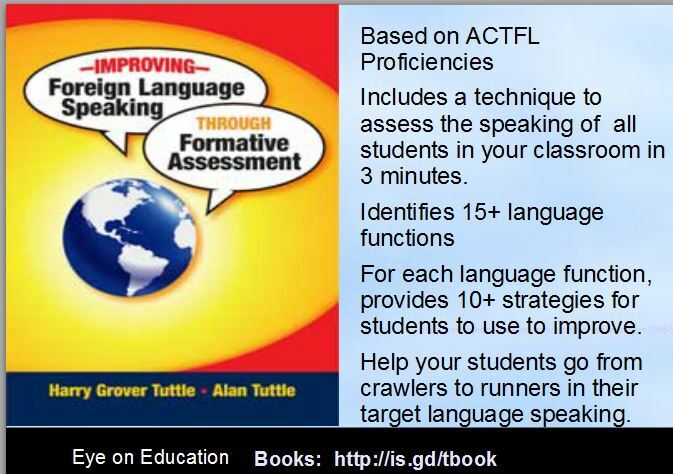 At http://bit.ly/tpthtuttle, I have 30+ ready-to-use activities (about 24 for Spanish and 6 for all Modern Language) to develop student speaking through highly structured or scaffolded, speaking. Students work in pairs to communicate. My ebook ,Modern Language Proficiency: Can-Do Strategies is available at http://bit.ly/tsmash. It contain many activities to help students advance through the Can-Do statements with half the activities focusing on interpersonal communication/ speaking. What Can Your Modern Language Students Do in Terms of Real-Life Communication? As I prepare for my Spring semester, I am asking myself for each chapter in the textbook “What can the students do after learning this unit?” Unfortunately, the most common answer is to “talk about the topic” . How real world is their learning? As I think about the school chapter (classes, things in the school, parts of the classroom), I realize that the topic is one that relates to students but I wonder how often will they use these vocabulary words, phrases and questions outside of school? How important is it to daily life outside of the school in the target language country? Most modern language travel books do not even include school as a topic. Maybe we should rethink the topics in textbooks to better prepare our students to actually be in another country. What topics are truly important for students to be in a target language country? For example, NCSSFL-ACTFL Can Do Statements include in the Novice Mid level “I can ask and understand how much something costs”. When do your student learn “how much something costs” in your curriculum? Mine occurs in the fifth or last chapter we cover. How does that match up with what students would need to know if they were in another country? Let’s move from academic modern language to real world modern language for our students! How does your textbook match up with real world modern language use? How many courses do I need before I can speak to people in the target country? He did not say “How many courses do I need before I can use the subjunctive?” or “How many courses do I need before I can use double object pronouns in a sentence?” He wants to use the language, not study it. At the same site, I have a series of modern language visual stories with no words (the beach, the city, school, etc.) for two students to role play; the restaurant role play involves four students. These can use in any language since there are just visuals, no words. 1) Most of the conversation or dialogues in the textbook are structured to teach/practice the grammar. These conversations do not have a natural flow as real life conversation do. Verification: Ask a native speaker if she or he would actually say that conversation. 2) Most textbooks have more pages devoted to grammar than to communication. In one text there were twice as many pages devoted to teaching/ practicing grammar than to communication exercises or even vocabulary. Often the communication exercises were simply meant to practice the grammar. Verification: If no one cares about the answer, then the questions are probably grammar exercises. Is your textbook really a grammar book or does it focus on communication? My Spanish spontaneous speaking activities (28+) includes Structured Speaking (Students substitute in or select words to communicate in pairs), Modified Speed Dating (Students ask partner a question from a card-whole class), Speaking Mats (Can talk using a wide variety of nouns, verbs and adjectives to express their ideas- pairs or small group), Spontaneous Speaking (based on visuals or topics in pairs), Role Playing (Students talk as people in pictures or drawings from 2-4 people), and Grammar speaking games (pairs or small group). Available for a nominal fee at Teacherspayteachers: http://bit.ly/tpthtuttle. I have a series of modern language visual stories (the beach, the city, school, etc.) for two students to role play; the restaurant role play involves four students. Can use in any language since there are just visuals, no words. In another blog, I argued how textbooks can be replaced with QR codes. I think that modern language classroom is an ideal place to replace the textbook with QR codes. – With QR codes, teachers can link to a comprehensive list of vocabulary for a given topic. The teachers can indicate critical vocabulary and useful vocabulary. Some textbooks introduce certain fruits in one unit and, then, more fruit in another unit. Many textbooks have only a partial list of vocabulary for a topic even when it is the only unit for that topical vocabulary. Many textbooks do not include verbs, adjectives, and typical sentences when they present the noun vocabulary list for a topic. The teachers may link to various language apps that not only illustrate the word but show it in English and the target language. – With QR codes, foreign language teachers can link to videos that introduce and review grammar in diverse ways. The educators can have QR codes that link to different types of online grammar practice. The educators are not limited by the textbook’s manner of presenting or reviewing grammar. – With QR codes, modern language teachers can link to audio or video files of native speakers who are talking about important topics. Either the teachers or the students can record the native speakers as they talk about such things as family, eating, weekends. These conversations are authentic conversations, not ones designed to teach a particular grammar point. Likewise the teachers can link to radio or TV shows from the target area. – With QR codes, foreign language teachers can link to current or past cultural events in the target language country. Students can learn about the culture as it happens as opposed to waiting for the textbook to possibly cover it in a future unit. The teachers can use QR codes to show what is happening at this very moment in the target language country. – With QR codes, the modern language teachers can link to pictures or videos that serve as speaking prompts or the basis for a conversation. These same pictures or videos can serve as writing prompts. The teachers select target language cultural pictures. For example, students look at a family having a Sunday picnic in Tijuana, México. – With QR codes, the foreign language teachers can link to quick formative assessments that students take in just a few minutes to demonstrate their achievement of some learning goal. – With QR codes, modern language teachers can link to target language reading such as the news, magazine articles, and literature. They can have the students read authentic materials. Students can select which aspect of the news they want to read about such as sports, TV, politics, and food. Why not try a mini-QR code lesson to see how engaged in the target language the students become? My Spanish spontaneous speaking activities (25+) includes Modified Speed Dating (Students ask their partners a question from a card-whole class), Structured Speaking (Students substitute in or select words to communicate in pairs), Role Playing (Students talk as people in pictures or drawings from 2-4 people), Speaking Mats (Can talk using a wide variety of nouns, verbs and adjectives to express their ideas- pairs or small group), Spontaneous Speaking (based on visuals or topics in pairs), and Grammar speaking games (pairs or small group). Available for a nominal fee at Teacherspayteachers: http://bit.ly/tpthtuttle. I have a series of modern language visual stories (the beach, the city, school, etc.) for two students to role play; the restaurant role play involves four students. These can use in any language since there are just visuals, no words.